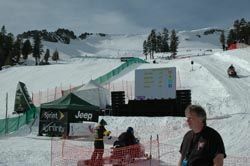 Spider Ranch Productions in California was asked to supply the sound for the Jeep King of the Mountain World Pro Ski and Snowboard Championships in Squaw Valley.Imagine finding a way to get 13,000 pounds of staging, amplification, loudspeakers, rack gear, and more up the side of a mountain. That's exactly what Alex Moran of Spider Ranch Productions in California had to accomplish when he was asked to supply the sound for the Jeep King of the Mountain World Pro Ski and Snowboard Championships. Moran provided a full complement of McCauley loudspeakers including MONARC MLA3's, MS3's, SM72's, including McCauley Sound's recently released M88 subwoofer with Lab.gruppen power and Dolby Lake and DBX 4800 processors for what's been referred to as "the loudest show on the snow." The King of the Mountain Ski and Snowboard Competition takes places in several stages in different locations with varying terrain. The second stop on the tour took place over four days at two different elevations of 8,100 feet and 9,200 feet at the Squaw Valley ski resort. Moran found that the only way to transport all 16 MLA3's by cable tram up the mountain. With four MS3's, four M88's, and eight SM72's, this proved difficult. "After the transport," says Moran, "we had to take ten car loads in a snow cat trailer to get it all to the final destination." The first day at the lower elevation, the entire inventory of McCauley gear was used. The MLA3's were stacked on the outer sides of the MS3's and the M88's. The SM72's were mounted on speaker stands down the course to distribute the coverage across the course for the downhill ski and snow cross competitions. For the men's and women's ski half-pipe competition, Alex stacked eight MLA3's on top of two MS3's, with two M88's standing next to that stack on either side of the half-pipe to get the best sound out to the audience and participants. Spider Ranch's MONARC system wasn't just there for the tunes. The King of the Mountain competition commentary required live audience announcers, television announcers, and audio feeds from video playback. "We had to take video tape rolls from the broadcasters in the television truck in order to have the audio feeds playing down to the participants," explains Moran. "Also, portions of the color commentary from the television announcers not only had to be sent to the broadcasting truck, but also to MONARC enclosures." Difficult weather conditions on the mountain intensified the stress the Spider Ranch crew was under. "The load in was pretty demanding as it had been snowing for the past 6 days. It was really taxing on all of us," recalls Moran. "It was zero degrees with the wind blowing, and we had to set up all the gear the day before the event instead of having two or three days to do it like we had initially planned." Although wind temperatures were below freezing and the snow had stopped just long enough for Spider Ranch to get the MLA3's and SM72's set up in time, the crew definitely felt the strain on time. "I've got to hand it to my engineers, when under pressure; we're still able to pull off a tremendous load in and production, despite the elements. "Squaw Valley is famously known for being the site of the second Winter Olympics held in the United States in 1960. The resort is lovingly referred to as "Squallywood." The nickname comes from a The Squaw Valley Writers Festival, which has been known to attract and produce some of the United States' top authors and screenwriters, and also had the pleasure of Walt Disney freeing a flock of doves during the opening ceremonies of the 1960 Winter Olympics. Difficult weather conditions on the mountain intensified the stress the Spider Ranch crew was under. Although wind temperatures were below freezing and the snow had stopped just long enough for Spider Ranch to get the MLA3's and SM72's set up in time. "The location of Squaw Valley is just breath taking" said Moran, "it would be hard to imagine being able to produce an event at that altitude and having it come off well to the audience, but MONARC has a way of overcoming the seemingly impossible. The HF section has enough headroom to overcome the altitude. What really makes it efficient is once you have the base processor setting for the MLA3 system configured, all you have to do are basic tone adjustments. It's a very natural sounding system. I got some great compliments on the system from the Jeep crew, snowboarders, skiers and bystanders alike. The sound was almost as impressive as the landscape, almost. "Although weather conditions were challenging, time constraints were stressful and setting up a complete sound system on the side of a mountain was easier said than done, Moran enjoyed the production, and was thankful the MONARC cells are easy to work with. "They're easily stackable which really made our job easier," said Alex, "and with all the elements working against us, it was good to have the McCauley gear working with us. All in all, the production was very successful and one I'll never forget." For more information visit www.spiderp.com.